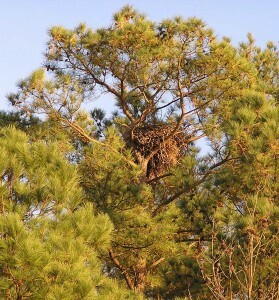 Eagle nest in loblolly pine tree along the Potomac River. Photo by Bryan Watts. The annual bald eagle survey is a significant conservation tool that has contributed a great deal to population recovery. The survey has allowed us to track population status and productivity. Nest distribution information is used daily by regulatory agencies. It has been the foundation of all management strategies. Our objectives in continuing the annual nest survey are (1) to monitor the recovery of the bald eagle in Virginia, (2) to document the status, distribution, and productivity of breeding bald eagles in Virginia, (3) to provide information to the government agencies charged with the management and protection of the Virginia bald eagle population, and (4) to increase our understanding of bald eagle natural history in Virginia. Bald eagle chicks with catfish in nest on York River. Photo by Bryan Watts. The size and productivity of the Virginia bald eagle population is assessed annually using a standard 2-flight approach. We conduct the first flights between late February and the end of March to locate breeding territories and to determine their status. We use a Cessna 172 aircraft to systematically overfly the land surface at an altitude of approximately 100 m to detect eagles and nests. The aircraft is maneuvered between the shoreline and a distance of 1-3 km to cover the most probable breeding locations. Nests detected are plotted on 7.5-min topographic maps and given unique alpha-numeric codes. Each nest is examined to determine its condition and status. A breeding territory is considered to be “occupied” if a pair of birds is observed in association with the nest and there was evidence of recent nest maintenance. Nests are considered to be “active” if a bird is observed in an incubating posture or if eggs or young were detected in the nest. The second survey flights are conducted in late April through May to check occupied nests for productivity and to recheck occupied territories for breeding. A plane is flown low over the nest allowing observers to examine nest contents and record the number of eaglets. 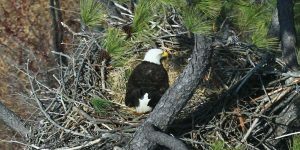 Although nesting bald eagles have been associated with the Chesapeake Bay throughout written history, the first formal survey of the region for eagles was conducted in 1936 by Bryant Tyrell. Tyrell was hired by the National Audubon Society to conduct a single-season survey of the Bay’s eagle population. By automobile and foot he covered approximately 5% of the available area and reported on 57 nesting pairs (17 of which were in Virginia). Although a humble beginning, Tyrell’s data on nesting success and productivity provided an invaluable benchmark view of reproductive rates before the introduction of DDT into the area in the mid-1940s. For the 20 years after the work by Tyrell, no surveys of nesting bald eagles were attempted. Bald Eagle incubating eggs in a nest in Northampton County. Photo by: Bryan Watts. Photo by Bryan Watts. Following the seminal article by Charles Broley detailing the decline of eagles in Florida and comments from him that the Chesapeake Bay population may represent a stronghold for the species, the National Audubon Society established a Bald Eagle Survey Committee in 1955 to collect data in the Chesapeake Bay region. Jackson Abbott was a member of the committee and would spearhead the bald eagle monitoring effort for the next 20 years. In the beginning, the eagle committee planned to rely on volunteer efforts to survey and monitor active nests and so launched a media and outreach campaign to involve local bird clubs. During the first year of the project (1956), 17 active nests were located in the 5-state region (6 in Virginia) and none were visited with enough frequency to determine productivity. It was clear after the first year, that the birding community was not large enough at the time to adequately survey the Chesapeake Bay. However, the committee continued following all leads and collecting all available information for the next 6 years. In 1962, the Chesapeake Bay project joined a national effort organized by the National Audubon Society and the first systematic survey of the Bay was conducted. The 1962 survey was composed of extensive aerial surveys followed by volunteer-based nest monitoring from the ground. Aerial surveys were supported by military personnel, as well as, U.S. Fish and Wildlife Service and the Maryland and Virginia state fish and game commissions. The survey covered approximately 80% of the available shoreline and located a total of 54 active nests (34 in Virginia). Alarmingly, of the 28 nests rechecked, only 3 produced young. Over the next 13 years, the annual bald eagle nest survey continued primarily with support by the U.S. Department of the Interior, respective state wildlife agencies, and a core of volunteers, the most dedicated of whom was Richmond native, Fred Scott. While Abbott conducted most of the aerial surveys of the Potomac and the northern portion of the Bay, Scott surveyed the lower Bay including the majority of Virginia. From the mid 1960s through the mid 1970s, Fred’s contribution of both time and money kept the Virginia survey going. 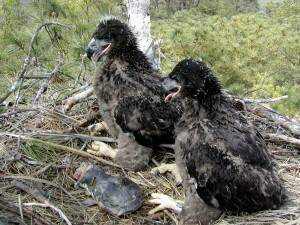 Over a nearly 2 decade period, Abbott and Scott served witness to a stable but unsettled eagle population. Productivity rates were low and both nest abandonment and relocation rates were very high. Eagle survey team including (left to right) Captain Fuzzzo Shermer, Bryan Watts, and Mitchell Byrd. Mitchell Byrd has surveyed nesting eagles in Virginia for 33 years. Bryan Watts has conducted the survey for 18 years. Photo by the Center for Conservation Biology. In 1977, the Virginia Fish and Game Commission (now the Virginia Department of Game & Inland Fisheries) took over responsibility for the annual eagle survey. Mitchell Byrd, long time conservationist and raptor biologist, took over the survey at this time. In addition to collecting a wealth of information on bald eagle nesting ecology, the annual survey has chronicled the recovery of the eagle population in the lower Chesapeake Bay. In the early years of the survey, vast areas that were once occupied by eagles simply had no birds. In the early to mid 1980s breeding pairs began to re-occupy historic sites as the population began a slow recovery. Click here to view the Virginia breeding bald eagle annual survey project page. Click here for information on the Eagle Nest Locator. Click here to view the Eagle Nest Locator data in the CCB Mapping Portal.